I know that I haven't been keeping up. All I can say is that the strain of flu that's going around this year is rather nasty and it's taken me quite a while to get over it. 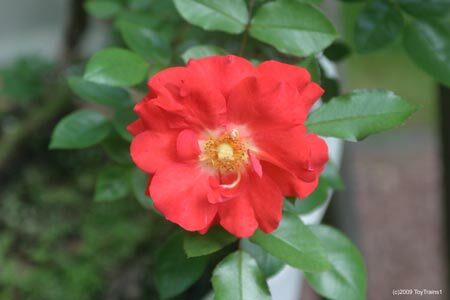 ::sigh:: Since I last blogged, we had the rainiest June in history here in New Jersey and that led to an explosion of black spot, which managed to almost defoliate some of the roses as I wasn't able to spray due to all of the rain and my health. 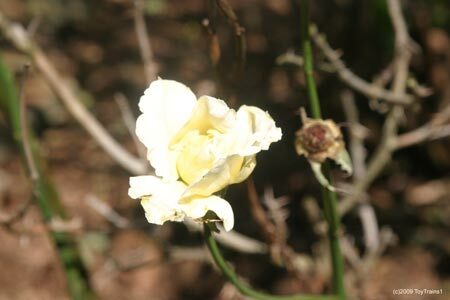 On a happier note, the last rose whose bloom I was waiting for, Garden Party, finally did so. Unfortunately, it coincided with the arrival of the japanese beetles, but I managed to get a shot of the first bud as it was opening before it got munched. Here it is. To my surprise, the mini-rose Caramba, in a pot on the deck, managed to survive the winter (while three of the roses in the ground did not) and has done rather nicely and bloomed as well. Here's one of the blossoms. In other rose news, I found a very nice rose at Lowes to replace Sunbright in the front yard garden. 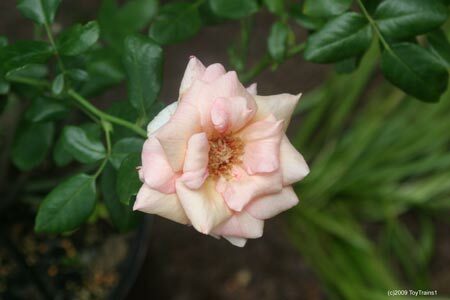 It's called Smooth Satin (also known as Hadsatin) and is a very nice pink with a nice fragrance and is mostly thorn-free. I bought it potted and in bloom and got it into the ground very quickly, where it's doing quite well. Here is the blossom that was on it when purchased. All of the other roses are doing well, though somewhat the worse for wear after all the rain and lack of spraying. I've posted at least half-a-hundred new photos on the web site. This year, I'm going to be sadly devoid of most of my lilies. 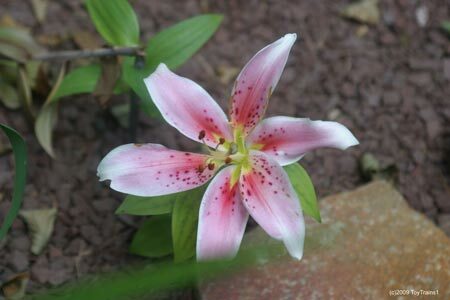 Some type of animal (as yet unknown) intruded into the garden and ate all of the buds off the many stalks of the white Asiatic lily (the only Asiatic lily I have left) and most of them off of the Mona Lisa Oriental lily. I got a grand total of one blossom on the latter. 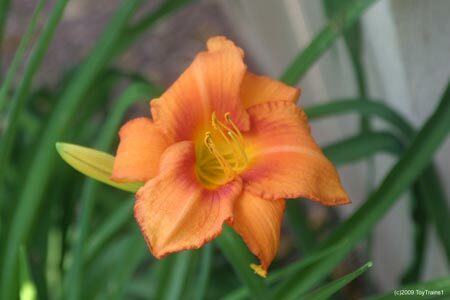 While I got photos of a few blooms on the daylilies Double Cutie and Leebea Orange Crush, the intruder also ate the buds, blossoms, and spent blossoms on those as well, so the few photos that I've posted are it for the year. This is Double Cutie. And this is Leebea Orange Crush. 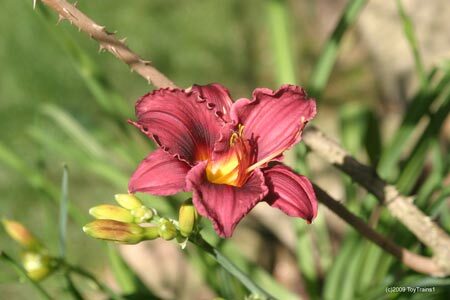 The third of my daylilies, Plum Perfect , is a later bloomer, so while the intruder ravaged that as well, it has more buds that will soon open. Here's the first. I'm keeping my eye on Plum Perfect and should the animal dare to show itself, since it finds my lilies and daylilies so edible, I'm hoping that it's quite edible itself. Turnabout being fair play and all that. I need to get back to a regular spraying regimen now that the rains appear to have let up (though we're having a heck of a thunderstorm as I'm typing this) and do some judicious pruning to see if I can bring some of the defoliated roses back to health. June was not only very wet, it was quite cool. July is also starting off quite cool and I don't know what that says about the climate. I do know that if any politician in the state so much as dares to utter the word "drought" this year, I will wish him a speedy drowning in one of our currently overflowing reservoirs. Oh, the grass is greener than I've seen in years and I have yet to turn on the sprinklers. 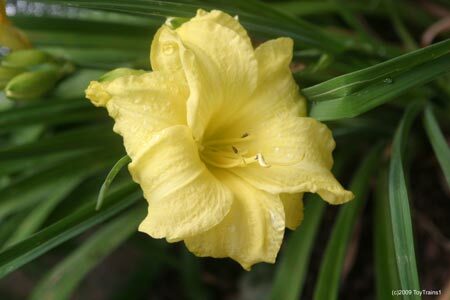 This entry was posted in Misc, Other Garden, Roses and tagged climate, Daylilies, fungus, Lilies, Weather. Bookmark the permalink. Hello! Have been enjoying your entries, and photos!! This year, absolutely NONE of my tiger lillies was found…all mysteriously disappeared. I had planted over 50…do you think it's rabbits, voles? If so, what do I do? I've heard of a pepper spray. I'm worried they'll eat my beautiful, toweing bearded irises..I have over 40 of those… Any help, I would LOVE! !